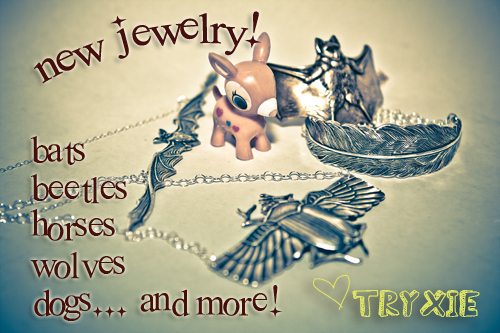 Brand new awesome and fun jewelry with a fall feel to them just arrived! Bats & beetles everywhere…not the creepy kind though. Feathers & horses for those into the cuter stuff. They all kind of dwarf me but i’m ok with that, they make a statement! This entry was posted in Uncategorized and tagged animals, jewelry, tryxie by admin. Bookmark the permalink.